What if sugar was TOXIC? What if the worst thing about sugar wasn’t that it was a source of empty calories, but that it was something that was slowly KILLING us? 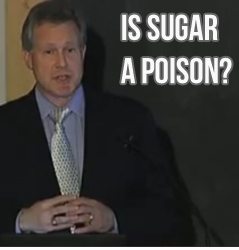 That’s the charge by Dr. Robert Lustig in his talk “Sugar: The Bitter Truth“? It’s been a mega-success on YouTube and you should check it out. There have been 1.5 million views as of 26th July 2011. To clear something up before we proceed, when Lustig talks about sugar, he’s referring to table sugar (sucrose) and high-fructose corn syrup. Specifically, Lustig says it is the fructose that is the problem. Fructose is twice as sweet as glucose, which explains why our candy, sweets, and sodas are sweetened with either sucrose or HFCS. (I’ve also heard that it’s hard to find a loaf in bread in America that doesn’t contain HFCS! I think that’s absolutely insane). So what’s the problem with fructose? It’s in the unique way it is metabolized by the body. 1g of carbohydrate from a potato and 1g of sugar don’t have the same effect on the body despite having the same caloric value i.e. 4 calories. The potato will be broken down into glucose and metabolized by cells in the body. The fructose from the sugar will go to the liver to be metabolized. Obviously if we DRINK that sugar, we make the problem even worse by dumping a lot of fructose into the liver quickly. And this is exactly what we do in this day and age, especially kids. Ok, so fructose goes to the liver to be metabolized. So what? How does that make it a poison? At 57:20, Lustig says, “What do we call it when we take in a compound that’s foreign to your body and only the liver can metabolize it, and in the process generates various problems?” He then says this is the definition is a poison. Obesity through conversion to fat and also encouraging overconsumption. He makes the great point that a high-sugar diet IS a high-fat diet in terms of what the end result in your body is. That’s a point I’ve been making for years and one that the average Joe on the street can’t or doesn’t want to understand. Regarding the above problems he concludes, “Looks like metabolic syndrome to me”. He puts up the following list of the effects of chronic overconsumption of ethanol (poison) and fructose to compare the two. Regarding fructose’s role in causing obesity through overconsumption, Lustig is making the point that we actually end up eating more because of it. But why are we eating more? He states that we eat more now than we ever did because our leptin (a hormone that tells our brain that we’re full and don’t want any more food) isn’t working like it used to. Why isn’t our leptin working like it used to? Our diets have a higher percentage of fructose than they ever did before, (see video for figures) and fructose does not stimulate the release of leptin. So those calories we get from fructose aren’t making an impact on our satiety and we therefore overeat. Obviously then the higher the percentage of our daily calories that come from fructose, the worse the problem becomes. He says that if you pre-load a kid with a can of coke before a meal, he’ll still eat the same amount of food even though he just consumed ~150 Calories. It’s funny how people who “just can’t eat another bite” after a large meal can always find room for a sugary sweet. As I’ve stated for a long time now, LDL isn’t a marker for heart disease in itself. It’s only the VLDL that matters in that regard. Since most of our tests only give us a total LDL reading, Lustig says that you can determine what has happened to your VLDL by looking at your HDL in relation to your triglycerides. The ideal scenario is high HDL (good) cholesterol and low triglycerides. Lustig says that this relationship predicts heart disease better than LDL ever did. From my years of looking into this, the typical result of someone going on a low-carb diet is higher HDL and far lower triglycerides. At 38:40 in the video, Lustig says that dietary fat raises your large bouyant LDL, but it is carbohydrate that raises your small, dense VLDL cholesterol. The biochemistry of this starts at around 58:00 minutes in the lecture and the lipogenic (fat-making) property of fructose is broken down at around 1hr 4mins. It should be stressed that Lustig isn’t saying that one serving of fructose is going to kill you. He’s saying that overconsumption of fructose over a period of many years may indeed kill you. And that is exactly the problem because fructose (from sugar and HFCS) has found its way into everything in our food. From bread to sauces, drinks, pretzels, low-fat snacks, hamburger buns…the list is unfortunately endless. It’s cheap for the manufacturers and it makes their products taste better. We’ve become addicted to the taste of sweet, so manufacturers know that if they take HFCS out of their products, the public will purchase from their competitors instead. You train INTENSELY 3-5 times a week, which helps burn glycogen. Think of this as helping to drain the body’s storage of sugar. You eat well. Any one of my diets will cut your sugar consumption way down and put you back on the road to health, helping reverse any damage you’ve done. (MANS, GLAD, TSPA). NOTE: The recommendation is not to avoid all fructose, especially in its natural form. Nature gave us fructose, but packaged it with a LOT of fiber – fruit. Personally, the only place I get fructose in my diet is from berries, apples, peaches, and the occasional orange. Eat Well, Live Long, & Enjoy Good Health! I totally agree with what you’ve said, and the points in Dr Lustig’s lecture. It’s sad that kids are growing up consuming grams of sugar from soda, sports drinks and junk food, and setting themselves up on the road to metabolic syndrome. Unfortunately, until we get past the calories in / calories out way of thinking, the government will continue to promote low fat and calorie controlled diets, without considering that maybe sugary products need to be regulated. A typical adult might think they can lose weight by drinking Coke, as long as their daily calorie expenditure is higher than consumption. Unfortunately they fail to look at all the facts – in particular the strong evidence that sugar is poison and even in a calorie deficit it is doing much harm in their bodies. Excellent articles about the health affects of sugar. Something I’ve been talking about for decades. Great info. keep up the good work! I’m a firm believer in a low carb lifestyle and always looking for new ways to back it up. The biggest problem I have encountered is that no one wants to believe it! I’m with Joshua, low carb living plus MuscleHack makes me feel, and look, Great. People just don’t want to listen to ya when they ask. In the U.S. it just seems we keep getting fatter and more lazy. Not me though. I’m not changing my lifestyle for anything. Thank You Mr. McManus for showing us MuscleHackers a better way of living!!! happy to read this stuff in shapes I can send to friends and family I care about. What about Fructose through other fruits likes grapes and all which do not have much fiber? Should they be avoided? Thanks a lot for this email and a you tube link to Lustig’s presentation. I appreciate the details or summary that you reiterated in your review along with exact time in the video. I continue to admire your work. Grapes have a type of sugar called “Grapetose”. Serious. And this stuff is very high glycemic. Think about raisins and their sugar content. So would it be the most beneficial to go on a sugar-free diet and only get sugar from natural sources such as fruits? I knew fructose was bad, so this video just reinforced that. What was shocking was the equation of fructose with alcohol. Whenever I go out socially, I’ve tried to stick to wine or some sort of no sugar coctail, like a martini, or a vodka tonic. 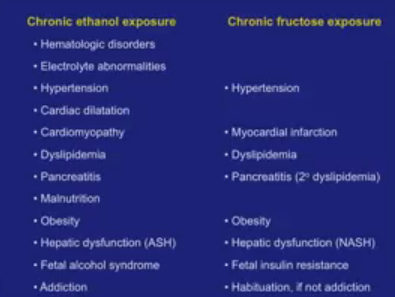 But the way he equated fructose with ethanol has given me a whole new perspective. I don’t think I’ll ever be able to drink any alcoholic beverage without mentally equating it to a can of coke. I also find it really interesting that the biochemistry behind why fructose, not only doesn’t supress hunger, but increases it, is the same for fructose and ethanol. Have a few cotails at a party, and what happens? You get the munchies. Have a few cokes, and the same thing happens. Holy crap! @John. Regarding grapes, or any fruit, bear in mind that it is chronic overconsumption that causes problems. But overconsumption is easy in our world today because of the prevalence of sucrose and HFCS in our foods. A hand full of grapes isn’t going to hurt you, but I would stick to fibrous fruits. Just cut out or limit both sucrose and HFCS from your diet, apart from fruit. @Amanda. Exactly. Get any fructose from fruit, where nature put it. People talk about sugar/sucrose being natural, but just look at the natural form – sugar cane. It’s a thick fibrous stick that you could beat someone over the head with. Quite different from the granulated stuff in the kitchen. Greetings Mark! Loved your article. Couldn’t agree more but instead of going through all this science mumbo jumbo, a general view that works is to consume in moderation. Even avoiding sugar altogether is dangerous. Hypoglycemia? See where im going? Natural unprocessed fruits cant be all that bad. Whatever is mad made is usually very bad such as HFCS!